PCBL has been generating leads for members since 1991. We meet every Thursday at 7:00 a.m. for breakfast, at Round the Clock in Valparaiso, IN. The Porter County Business League has been generating leads for members since 1991. At that time, several of our founding members belonged to a “national” networking group and realized they weren’t getting much in return for dues sent faithfully to the group’s corporate office. And so, the Porter County Business League was chartered as a 501-c non-profit organization. All dues collected stay right where they belong …with our membership – locally! The League meets every Thursday at 7:00 a.m. for breakfast. Currently we meet at Round the Clock restaurant in downtown Valparaiso (NW corner of Morgan and Lincolnway). The meetings are about one hour in length and include networking time, member “commercials”, referral sharing and featured member speakers. Occasionally the League may invite a non-member to speak on a topic of interest to the group. Business owner, sales professional or entrepreneur PCBL is the right networking and lead-generating group for you. There are many great organizations within the community that PCBL would like to help promote. 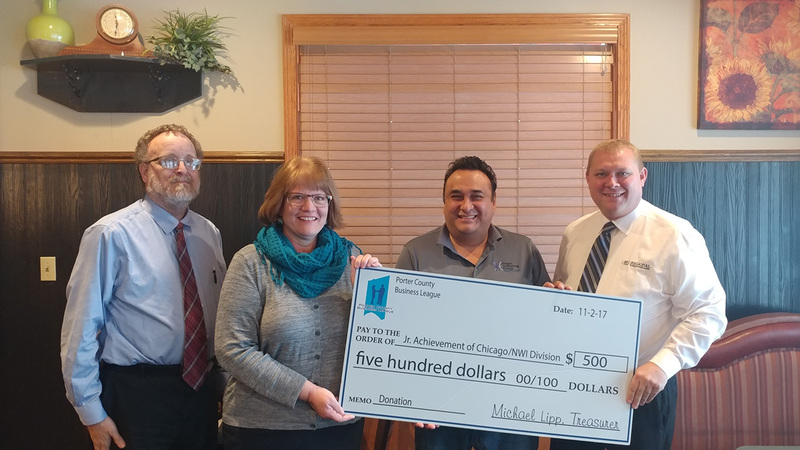 On November 15, 2018 we were honored to present a donation of $500 to the Porter County Junior Achievement. They are a great organization that helps students within Porter County learn real-life lessons and helps them build the confidence they need to succeed.